McCutchen comes from Fort Meade, Florida, a phosphate mining town of 5,000 people in the center of the state, about 70 miles east of St. Petersburg. He didn't have a lot of coaching before signing with the Pirates. Andrew always wanted to be a Major Leaguer. "I was probably 5 years old when I first started playing T-ball and I knew then that playing in the big leagues is what I wanted to do," McCutchen said. "We'd watch the Atlanta Braves play on TV all the time back when a lot of their games were on TBS. I'd watch those games when I was a little kid and I'd be fascinated. "I always felt this is where I was going to be and I've always prided myself on being the best I could possibly be. I have high standards for myself, and I expect to reach them." Andrew's father, Lorenzo, was a youth minister at the non-denominational church where Andrew sang in the choir, Lorenzo has served as the consummate role model for his son. He grew up in Fort Meade, played college football at Carson-Newman College in Tennessee, married his high school sweetheart (who played volleyball just down the road at Polk Community College), and settled back in his hometown. Andrew credits his father for instilling in him the character and determination that have not only helped him seize his potential, but also serve as the foundation of a makeup that scouts universally grade as above average. It never mattered that Lo, his dad, had just finished an overnight shift at the mines, smelling of phosphate with arms caked in mud. Barely able to stay awake, Lo would take his son's small hand an lead him imto the early-morning Central Florida sun, out to the open field behind the trailers. Lo would carry with him a paper bag filled with Wiffle balls, or sometimes fishing corks wrapped in electrical tape to make them round. Andrew carried a long broomstick handle. The way Lo saw it, drills with balls that quivered through the air unpredictably were good for the boy's hand-eye coordination. On a real field, the baseballs would look big as cantaloupes. The youngster attacked each pitch that his daddy fired with that stick. Andrew's mother, Trina, was 16 when she found out she was pregnant. It was crushing. When she told her parent the news, she could see the disappointment on her mother's face. Lo, 17, was by her side, just as scared as Trina. He was the star running back at Fort Meade High and hoped to play in college; Trina was a volleyball star who already had a scholarship to play at Polk Community College. After Andrew was born, Trina went to Polk, and the baby was left with Trina's mom and sister during the day. After two years Trina's time at Polk was up, and while her friends and teammates moved on to bigger schools, she "hit a low point. It was like, what could I do next? I couldn't afford college with a child. I had to grow up really fast." Lo went to Carson-Newman College in Jefferson City, Tennessee, and redshirted his freshman year. Football was his love, but deep down he knew what he had to do: Lo's father had abandoned him when he was young, and he had told himself he wouldn't do the same. "I had to grow up, make some decisions," Lo says. "And the decision was to come home." So Trina and Lo both found themselves in Fort Meade. Trina decided that there was no one better to teach Andrew to be a man than his father. And so Lorenzo McCutchen and Petrina Swan were married on August 1, 1992. That day they made a pact: They were going to raise this child right, with all the work and all the love that would be required. Fort Meade High didn't make the high school baseball playoffs, going 8-14 with a schedule that saw the team struggle against teams from higher classifications. But McCutchen managed to bat .709-11-28 with eight doubles, three triples, 23 walks, and six strikeouts. Plus, Andrew graduated with a 3.8 grade point average. 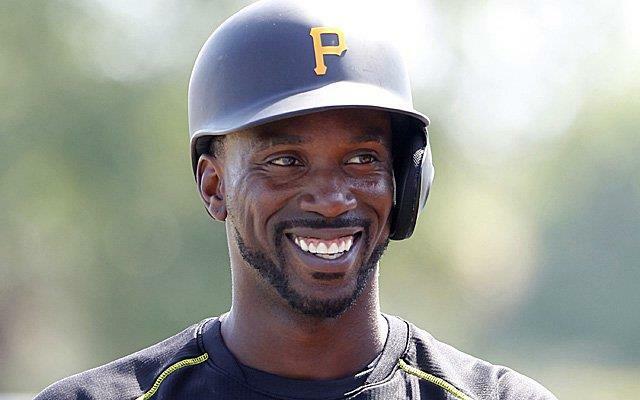 One scout from a Major League team asked his high school coach, "I want to know something bad about Andrew McCutchen." The coach was stumped. "Well, there was this time he missed practice," coach said. "Why?" said the scout. "His truck broke down on the highway." It capped a remarkable career at a school that is best known for its football tradition. Fort Meade captured its first state football title this year, finally taking the prize in its fifth trip to the state finals in the previous six years. McCutchen was a standout wide receiver before he injured his knee, tearing both the ACL and MCL in the open field on a rainy night his sophomore season. It was an injury that made him reflect on his priorities. This was, after all, a player who batted .507 as an eighth grader. McCutchen decided the risk of playing football wasn't worth sacrificing his baseball ambition. While he was recovering from knee surgery. During McCutchen's senior year at Fort Meade High School in Fort Meade, Florida. in 2004, he batted .474 with eight home runs, 40 runs batted in (RBIs), 45 stolen bases, and only four strikeouts. He also played football and ran track. McCutchen was one of the top football recruits in the state of Florida but opted for a career in baseball. He was also a part of a state title winning 4 x 100 meter relay his freshman year of high school. Size shouldn't be a factor when it comes to Andrew. He doesn't expect his size to keep him from reaching the big leagues either. "I'm not the only small guy out there," said McCutchen. "There are plenty of people who play in the big leagues who are as big as I am. I'm sure as I get stronger and develop I'll develop into a bigger player. That's kind of scary thinking about that. "My parents taught me ever since I was little to always be a humble person," said McCutchen. "The Lord God blessed me with all of these talents and all of these abilities. He can also easily take them away." Andrew's first job was as a bank custodian. Before 2006 spring training, McCutchen was rated the second best prospect in the Pirates organization by Baseball America. And in the spring of 2007, they rated Andrew as the #1 prospect in the Pittsburgh farm system. And he was back at #1 in the Pirates organization in the spring of 2008. In the winter before 2009 spring training, the magazine had Andrew at second best in the Pittsburgh farm system, behind only Pedro Alvarez. During 2006 spring training, Pirates manager Jim Tracy described McCutchen as: "Instinctive. Poised. For a kid of his age, he's off the charts. He's going to be a good Major League player someday, a really good Major League player." Andrew didn't get tired at the end of the 2006 season, and he believes it is because he gets his rest and eats right. During 2007 spring training with the Pirates, McCutchen was in 18 games, hitting .308 average (16 for 52), sixth-highest among those Pirates with at least 30 at-bats. But he was still sent to minor league camp. During the 2008 season with Indianapolis, McCutchen reached base in 27 consecutive games, thanks in part to a 13-game hitting streak. "I want to be consistent," Andrew said. "I believe consistency is something all big leaguers have, and that it's something that keeps some players away from the big leagues. "Even if the hits aren't there, I want to have productive at-bats, draw walks, steal bases and score runs. Even if you don't have a hit, you can have a productive day," McCutchen said. Andrew is thankful to have the occupation he has. "I have to pray before my games because God is the one who got me in the position that I'm in now. I have to thank Him for that," McCutchen said. Andrew says his favorite restaurant is Texas de Brazil, a chain of Brazilian-style steakhouses. For music, he likes rap (especially Lil Wayne), R&B, and gospel. He doesn't drink alcohol at all. McCutchen says he would like to meet Eddie Murphy. In 2009, McCutchen showed great maturity in his rookie season with the Pirates as he was called up from Triple-A Indianapolis on June 4 and given the difficult task of replacing center fielder Nate McLouth, who had been traded to Atlanta the night before. In 2008, McLouth had won the Gold Glove award and played in his first All-Star Game. "He wasn't awed by the big leagues," Doumit told ESPN.com's Jerry Crasnick. "He was up for four months and there was never a time where he struggled for an extended period. He didn't play like a rookie. He played like a 10-year veteran." McCutchen also showed the ability to come through in the clutch, particularly on Aug. 25 against Philadelphia when he stepped to the plate against closer in the bottom of the ninth inning with the game tied 4-4, none out and teammate Brandon Moss on second base. After misplaying Shane Victorino's line drive in the top of the ninth that enabled the Phillies to tie the game, McCutchen was just looking to hit a ball to right side to advance Moss to third but instead drove a 96-mph fastball into the right-center field seats for a game-winning two-run home run. "It was the perfect at-bat," Pirates general manager Neal Huntington said. "He did the right thing mechanically and mentally, and he miss-hit the ball and won the game with a home run. That sounds silly to say, but he was trying to hit a line drive to the gap and he was under it by a shade, and it left the ballpark." McCutchen developed a close friendship with fellow outfielder Lastings Milledge after he was acquired from the Nationals in a trade during the 2009 season. Both players were first-round draft picks as high school seniors in Florida, Milledge selected by the Mets in 2003 from Lakewood Ranch High School in Bradenton and McCutchen taken by the Pirates in 2005 from Fort Meade High School. "I'm glad to see that they finally came together," McCutchen's father, Lorenzo, told the Pittsburgh Post-Gazette's Chuck Finder during spring training in 2010. "Because when Andrew was coming up, they always called him 'the young Milledge,' tht kind of stuff. For them to come together, and here they are playing together, is is something." In 2010, McCutchen had clearly assumed a leadership by the time spring training began, even though he had just four months of Major League experience. "Andrew goes about his business the absolute way you want people to," Pirates general manager Neal Huntington said. "So, he should be a good influence on anybody." McCutchen's father was not surprised to see his son quickly become a player his teammates looked up to. "Andrew has always been mature for his age," Lorenzo McCutchen said. "He knows that this is his destiny. We tried to prepare for it as much as we could. He's walking in it right now. "For one thing, I had a cousin who was a professional football player, and he didn't do all the right things. Matter of fact, he ended up on drugs and all that stuff. So we always told Andrew: 'Make sure you don't end up this way. Do right and stay humble.' So far, he's doing that." On May 14, 2010, Pirates manager John Russell, who isn't prone to hyperbole, had praise for McCutchen after he went 5-for-5 with five runs scored against the Cubs. "He's so dynamic," Russell said. "Not just talent-wise. He's got a great head on his shoulders. He handles adversity well. He handles success very well. He's a very level-headed young man. That's why I talk about him being a very dynamic player in all facets, it's not just one or two things, or how he plays. It's everything about him." Tigers manager Jim Leyland joined the growing legion of McCutchen admirers. Leyland was the Pirates' manager from 1986 to 1996 and still lives in Pittsburgh. If it were up to the students at Linton Middle School in Penn Hills, Pa., there would be little doubt who is the Pirates' "Face of the Franchise." During a winter caravan stop there in January 2011, Ross Ohlendorf got noisy applause. There were claps and whoops when Evan Meek was introduced. The cheers got even louder when Andrew McCutchen took a bow. But the crowd of 700 fifth- and sixth-graders saved its loudest, longest screams for ... the Pirate Parrot. "He's been here longer than me," McCutchen said, grinning. "I can't compete with that." "The face of a franchise is the guy you put on the cover of the media guide," said Andrew Fernbach, a public relations executive at DeGennaro Communications in New York. "If he's a pitcher, you buy tickets when it's his turn in the rotation. If he's a position player, you make sure you're not in line at the concessions when he's at bat. And from a marketing standpoint, he's the guy you sign to an endorsement deal if money is no object." It stands to reason that anyone who becomes a professional athlete is a competitor. And competitive people hate to lose. Thus, it is easy to understand why Pirates center fielder Andrew McCutchen is not completely satisfied with his first two seasons in the Major Leagues. It doesn't matter that McCutchen has the look of a future superstar and, in many respects, has already established himself as the Pirates' leader. The Pirates have gone 62-99 and 57-105 the past two seasons. To McCutchen's way of thinking, those hideous records have wiped out a lot of satisfaction he might be able to take from hitting .286 with 28 home runs and 55 stolen bases in his first 262 games. "I hate to lose," McCutchen said "I don't care if it's spring training, an intrasquad game, or two square, I'm out to win." Two square? McCutchen described it as a game played with a volleyball and two or four players on a court with two squares. The team that wins is the one that puts the ball in its square or sends the ball out of bounds. McCutchen is hopeful that the worst of the losing is over. He is confident that the hiring of manager Clint Hurdle will add spark to the team. In August 2012, Pirates manger Clint Hurdle said of McCutchen: "I don't think I've ever met a more intelligent, mentally-tough, balanced young man in my life. I've had some conversations with him in the past month that have been awesome. Interesting. I don't know what it's like to go on the field and have people screaming 'M-V-P!' for you. I know what it's like to go on the field and have people screaming at you." To truly appreciate McCutchen's athleticism, you have to watch him make behind-the-back catches of 380-foot flies while shagging in center during batting practice. Andrew's celebrity fame began to show after a great 2012 season. He appeared on the video game cover of MLB '13 The Show, with McCutchen taking his well-earned and richly deserved place on the popular game's cover. He smiles when he recalls the story about the little girl who was so excited about meeting him on the Pirates' winter caravan before 2013 spring training, that she burst into tears. On that same caravan, a Pirates fan in his 20s asked McCutchen to hold the engagement ring while he proposed to his (the fan's) girlfriend. Favorite pregame meal: "Something from Subway," McCutchen says. "Cutch's Crew," begun in 2010, mentors inner city at-risk youth and baseball players in the Greater Pittsburgh area. Attending games and special clinics at PNC Park are features of the program. September 17, 2013: Andrew was one of 30 nominees for the 2013 MLB Roberto Clemente Award, was presented with the Pirates Roberto Clemente Award in a brief but illustrious pregame ceremony. Vera Clemente, the late humanitarian's widow, and Pirates club chairman Bob Nutting participated in the presentation to McCutchen. August 8, 2013: Andrew's mother, Petrina McCutchen, belted out the national anthem prior to the Pirates game vs. the Diamondbacks in PNC Park. Not surprisingly, she hit all the notes. October 1, 2013: For the second time in two months, Petrina McCutchen delivered the national anthem prior to a Pirates game. This time, Andrew's Mom had a lot of help. Caught up in the emotion of Pittsburgh's first postseason game in 21 years, the sellout crowd of 40,487 sang along with her, part of the amped-up fans' loud and vocal pregame celebration. 2013 Players Choice Award: For the second year in a row, standout center fielder Andrew McCutchen of the Pittsburgh Pirates was named National League Outstanding Player. Andrew's accomplishment can be attributed to his success in all phases of the game. At the plate, Andrew attained an impressive .317 batting average, with 84 RBIs, 185 hits, 21 home runs, and .404 OBP. November 2013: McCutchen and David Ortiz are becoming a producer of his own MTV television show. MTV Networks and Major League Baseball said they are collaborating on a weekly 30-episode series that melds pop culture and baseball. Ortiz and Pittsburgh Pirates All-Star outfielder Andrew McCutchen are both executive producers of the series, set to begin next spring around the start of the new season. In 2013, McCutchen was named the National League MVP. And he won by a healthy margin, drawing 28 of the 30 first-place votes from members of the Baseball Writers' Association of America. McCutchen, third in MVP balloting last season, got 409 points. Arizona first baseman Paul Goldschmidt finished second with 242, while St. Louis catcher Yadier Molina received the other two first-place votes and came in third. Andrew became just the fourth National League center fielder to win the MVP award in MLB history. He joins Willie McGee (1985), Dale Murphy (1982, 1983), and Willie Mays (1954, 1965). November 2013: McCutchen comes from a very musical family, so it shouldn't be too surprising to hear he was asked to be a presenter at the 2013 American Music Awards in Los Angeles. Cutch gave out the award for Favorite Male Artist—Country. December 11, 2013: Andrew proposed to his girlfriend of four years, Maria Hansloven, on "The Ellen DeGeneres Show." McCutchen introduced a video about rounding the bases in their relationship, brought Hansloven on stage, gave some heartfelt thoughts, and got down on one knee. "I've always envisioned that I would be on the highest mountain in the world and that my voice would be as loud as a lion's roar times a billion so the whole world could hear me just tell you how much that I love you," McCutchen said, standing on stage with Hansloven seated next to DeGeneres. "I didn't do any of this for the publicity; I didn't do any of this for the recognition. I did this to show you that if I could tell the whole world how much that I love you, I would do that." With that, McCutchen got down on one knee to the delight of the studio audience, and DeGeneres relayed the positive response from Hansloven to all. DeGeneres presented Hansloven with roses, and then broke out a veil for her and a top hat for McCutchen—both emblazoned with the Pirates' "P" logo. November 22, 2014: McCutchen was married exchanging vows with Maria Hanslovan during a private ceremony. On June 16, 2013, during a Pirates-Dodgers game at PNC Park, McCutchen hit a foul ball that looked like countless other foul balls hit every season. This foul ball was different though. This ball apparently kick-started the labor of the pregnant fan who caught it. "I told (my husband) that if one came my way I was ducking with my purse overhead," said the fan, Tiffany Gardone, to MLB.com. Her due date was still two weeks away and, in fact, she was at the doctor earlier that day and was told "no way I was close to having a baby anytime soon." And yet, at 11:36 pm that night, young Jeremiah was born. The story came full circle in December 2013, when Tiffany, Jeremiah and the whole family got a chance to meet McCutchen at the team's annual PiratesFest. He signed the foul ball, of course. When McCutchen was asked to identify the most significant ways he's grown as a person and as a ballplayer since he signed with the Pirates out of high school, he quickly cited changes in two different categories. "You definitely grow in a lot of ways, and one is physically. I remember being 18 years old and 165 pounds, soaking wet," said McCutchen, who weighs about 185 now. McCutchen's clubhouse democracy in action: He may be the team's senior member (he beat Charlie Morton by six days), but you'll get no reminders of that from him. "If Marte wants to say something to me, I'm not going to say, 'Hey, dude, I've been in the big leagues longer than you have. I'm not going to listen to you.' If we want to win," McCutchen said, "we have to be open to hearing other players. When you have that understanding, it creates a really good vibe in the clubhouse." "Everyone always looks for that one person to lead," Andrew said, "but there are others who can lead in different ways. By example, by words, by offering some good words of advice. I think we all lead to a certain extent, and that isn't something we've had in the past." Communication, in other words, is big in the clubhouse. It figures to be even bigger in the Pirates outfield when it includes Marte, McCutchen, and Gregory Polanco. The center fielder is as enthusiastic about those prospects as is any fan. In 2014, McCutchen was named to start for the N.L. in the All-Star Game. Lorenzo McCutchen and Petrina Swan were high-school teenagers when their son Andrew was born. Five years later, his parents made a choice that would change Andrew’s life forever. They were going to raise this child right, with all the work and all the love that would be required. The date was Aug. 1, 1992. After time apart at separate colleges, Lo and Trina found themselves reunited in Fort Meade, Fla. That’s when they decided to get married. Their story—and the rise of Andrew, the 2013 National League MVP—is chronicled in a September 2014 Sports Illustrated. The union of Lo and Trina is described as a life-changing moment for young Andrew. “Trina decided that there was no one better to teach Andrew to be a man than his father,” Albert Chen writes in Sports Illustrated. When Andrew was given the opportunity to compete at a higher level but lacked the financial resources to afford a travel baseball league, a coach named Jimmy Rutland offered to help. In the years that followed, Trina sold spaghetti dinners for $5.50 a pop to pay for Andrew’s baseball tournaments. The community came together to raise $5,000 to send Andrew to Puerto Rico to play ball. His parents’ hard work rubbed off on Andrew, who “didn’t beg Lo and Trina for money; he began working odd jobs,” Chen writes. Andrew never asked his parents for anything that he knew they couldn't afford. When he wanted a pair of Air Jordans, he began working odd jobs. It took a few months but he made the $200. One day he brought the cash to school, and when he went to his locker, the money was gone from his wallet. "It was the angriest I've ever seen him, to this day," his friend Kenny Eldell related. "He knew who took it. He wanted to fight, but instead, he made a statement. "'It's OK," he yelled out in the middle of the locker room, "because one day I'm going to have so much that $200 is going to seem like two cents. So take my money now, because one day you're not going to be able to touch any of it." If you spend enough time with McCutchen, his artistic side will come out. He sings, he beat-boxes, he plays the keyboard, he writes poetry, he draws. In one of his favorite poems, "Step Up To The Plate," McCutchen describes a dream he once had, a dream that could've come true. "I'm in my first game in the pros. It's on TV and I'm starting in center field," he says. "And of course it ended with a home run." He turned a closet in his Lakeland, Florida home, into a makeshift recording studio, outfitted with a mike and a recorder. In high school, Andrew carried around a notebook and sketched comic book character, professional athletes and sports logos. He still sketches in quiet moments away from the ballpark. "When I'm drawing, I have to force myself to calm down," he says. "To get in that mental mode so I can draw something exactly how I want to draw it—it's important to tap into that mental mode every now and again. To concentrate, to lock in," McCutchen says. Cutch is truly beloved in Pittsburgh, for his play, of course, but also for his community work. In June 2014, his publicist received a text at 2:30 in the morning from Andrew asking if he could meet some kids at Niketown in Chicago, where the Pirates were playing. At the store, he greeted nine honors students from inner-city Chicago schools, gave them each a shopping bag and told them to fill it up with whatever they wanted. Once, after working on a Habitat for Humanity project, McCutchen was told that the owner of the house had fallen behind in his mortgage payments because he was on disability leave from work. Cutch covered the payments, anonymously, until the man was able to get back to his job. "It's not just that no one gets their hands dirty like Andrew," said Maggie Withrow, executive director of the Pittsburgh brand of Habitat for Humanity. "He also wants to know about the families; he wants t know how the program works. It's important to him that it wasn't a giveaway, that the families put in the work. He follows up because he cares." Andrew is going to need a new hat. He arrived at McKechnie Field on March 26, 2015, sporting a newly shorn look after cutting off his trademark dreadlocks. Standing in front of his locker, McCutchen placed his old Pirates cap atop his head and said it felt like "shaving out the inside of a watermelon and putting it on your head and putting a hat on top of it, and then taking that watermelon off." McCutchen released a video on YouTube too, to unveil the news. "It was just time. I've had [dreadlocks] for such a long time now, and they were starting to get a bit long," McCutchen told reporters. "I made up my mind: After I get married and we get settled, it was something I was going to do. So I was looking forward to it." Ten strands of his former dreadlocks will be auctioned on MLB.com. All the proceeds will benefit Pirates Charities. "It is a bit strange, but hey, I guess there could be some value in it and doing it for a great cause," McCutchen said when asked about the thought of someone else owning his hair. "I'm happy they're doing it. It'll be great. It's going to be good. I can be like everybody else, like all the rest of the guys on the team, and get a new haircut every two weeks." McCutchen recalls walks with his mom in the late 1990s. She, a one-time athlete, exercising to get back in shape after the birth of a daughter. He, already a young athlete of renown at 11. As Andrew remembers, "We'd walk. And sometimes jog." One time, the jog accelerated into a run, and Petrina McCutchen flashed back to her volleyball and track days. "She picked up the pace, and started really, really running," the Pirates star recalled. "And I was like trying to beat her. I either barely beat her, or she beat me—one or the other. But she definitely made me get going. So I'm thinking, 'OK, I see where I got my speed from.'" Andrew got much more than just his legs from Petrina and dad Lorenzo McCutchen: his work ethic, commitment to set and pursue goals, faith. And responsibility? One cannot minimize that life lesson from people who were in high school when they became parents but did not become husband and wife until their son was nearly six. Petrina and Lorenzo wedded to ensure Andrew grew up in a stable, loving home. Andrew's baseball skills would have found daylight regardless, safe to say. But it did not hurt to have Petrina prepare and sell those $5.50 spaghetti dinners to fund his way to baseball tournaments, or for the Ft. Meade, Fla., community that embraced her to raise the $5,000 to send him to Puerto Rico for more high-profile exposure. After a victory over the Padres, McCutchen made a pit stop at the foot of the left-field bleachers in Petco Park and handed his batting gloves to a pair of fans wearing Pirates colors. McCutchen said he noticed the family of four cheering on the Bucs and waving the team flag as Mark Melancon whiffed Derek Norris to end the 5-2 win. McCutchen didn't stop to chat. He quickly sprinted toward the infield for a brief celebration. "Story behind it? Nah," McCutchen said. "It was some kids out there in old-school unis. I ran out there and gave them my batting gloves. I mean, way out here in San Diego to have some Pirates fans? It was pretty awesome." Clint Hurdle said McCutchen has become a go-to leadership guy in the clubhouse, too. Accordingly, the two meet every week to 10 days to discuss the team and any particular issues McCutchen might like to verbalize. "The majority of what we talk about is pretty classified," McCutchen said. "We have a good relationship. I just go in and we talk about whatever we need to talk about. He just tries to let me know that the door is always open. If I have anything on my mind, he wants me to be comfortable enough for me to go in there to tell him. And the same thing for him." McCutchen is also a member of Hurdle's leadership council, consisting of players who meet on a weekly basis to air team issues. In his seventh season, Hurdle is also relying on McCutchen for his insight and expertise. If you call the Polk County Sheriff's office today, chances are Petrina McCutchen, Andrew's mom, will still be the one on the other end. "She has always worked, and still does, supporting my sister and her endeavors," Andrew says. Loren, Andrew's only sibling, graduated in 2014 from Ft. Meade High School and is studying nursing at Florida A&M University. She credits her big brother with setting a great example for her—but that is just yet another of Andrew's inheritances from his parents. Andrew and Petrina share a unique relationship, no question. Parenting experts clinically advise people to "be a parent, not a friend" to their children, but Andrew is blessed to truly have both. "My family is very young," Andrew said. "My parents are in their 40s. We we all just hang out and have a good time. It's always very relaxed, laid-back, laughing about whatever, joking around. Now that my wife [Maria] is in the mix with the family, it makes it even that much more special. I made Pittsburgh my home, but I still have a place in Lakeland, right outside Ft. Meade, because my parents are still there, and I get back there whenever I can. "Sons typically are challenged to express their feelings for their moms. Not so much because of the proverbial "it's a man thing," but because it's almost a rhetorical question. You can read the emotions on the sons' faces, however. Andrew's face is an open book when Petrina belts the national anthem prior to a Bucs game at PNC Park, which she has done a few times. "I'm proud of her, to see her on such a big stage being able to use the gift she's blessed with—her voice," Andrew said. "I've been hearing it all my life. She probably started singing to me when I was in her womb. "As a kid growing up, [your mom] is always proud of what you do, of what you've been able to become. July 14, 2015: With his solo home run, McCutchen joined an elite group of Pirates All-Stars. Leading off the bottom of the sixth against Rays righthander Chris Archer, McCutchen launched a first-pitch slider into the left-field seats at Great American Ball Park. It was the first All-Star Game home run for McCutchen, making his fifth trip to the Midsummer Classic. It also put McCutchen in good company with a few other Pittsburgh legends. The last four Pirates to homer in an All-Star Game were Dave Parker (1981), Roberto Clemente (1971), Willie Stargell (1965), and Ralph Kiner (1949-51). (A Berry - MLB.com Andrew was elected on Wednesday to the Arizona Fall League Hall of Fame. August 19, 2015: Another accolade to McCutchen's growing collection. The former National League MVP was elected to the Arizona Fall League Hall of Fame. • McCutchen has accumulated more total bases (1,864) than either Bonds (1,783) or Clemente (1,693). • McCutchen's double was career No. 230, more than either Bonds (219) or Clemente (176). One other key department in which McCutchen could lap his two iconic predecessors: team wins. Clemente's tenure peaked with 97 wins by the 1971 Bucs. Bonds' 1991 crew won 98 games. Cutch's 2015 Pirates also won 98. McCutchen's accomplishments are not lost on Clint Hurdle, who has watched McCutchen turn into one of the game's best players over the last few years while helping Pittsburgh end its 20-year streak of losing seasons. October 30, 2015: McCutchen's baseball career has been full of awards and accolades, but this honor he received resonated in a special way for him. McCutchen was named the winner of the 2015 Roberto Clemente Award presented by Chevrolet before Game 3 of the World Series at Citi Field, an honor named after the iconic Pirates outfielder for his positive contributions on and off the field, including sportsmanship and community involvement. "It means a lot. I feel like it means a bit more to me, just because of it being Roberto Clemente and him playing for the Pirates, wearing the same uniform," McCutchen said. "It just shows that I'm moving in the right direction as far as being able to do the things that I want to do off the baseball field. Just getting a prestigious award like this is very humbling." McCutchen has been working with the Make-A-Wish Foundation since 2012, according to Dana Antkowiak, the marketing and communications manager for Make-A-Wish Greater Pennsylvania and West Virginia. During that time, he has visited 11 children with life-threatening medical conditions. In Spring Training, McCutchen spent a whole day with Owen Taylor, a 7-year-old boy from Everett, Pa., who has a heart condition. In August at PNC Park, McCutchen hosted Cameron Pittman, a 12-year-old from Altoona, Pa., who is battling Hodgkin's lymphoma. "He has this uncanny ability to very quickly put the child at ease. Very engaged in conversation, asks questions about their interests and their experiences. It's really remarkable," Antkowiak said. "In letters and notes we receive after the wish, these families are profoundly impacted by their experience with him. "The same can be said at the Children's Hospital, where Gessner and the entire staff were particularly pleased to see McCutchen win the Clemente Award. A simple exchange between Andrew and the McCreary family (four very loyal Pirates fans, arguably his most loyal West Coast fans), was caught on camera, swept through social media on a digital tidal wave and became one of those feel-good moments that fans from coast to coast couldn't seem to get enough of. All because of a couple of batting gloves, a fist bump and one very emphatic "I love you man" exclamation by an overwhelmed 12-year-old. "It was the least I could do -- just show my appreciation," McCutchen said. "I didn't think much of it. It's awesome just to be able to interact with the fans." The moment happened less than a minute after the Pirates secured a 5-2 win over the Padres on May 30, 2015 at Petco Park. Having noticed the McCreary foursome decked out in Pirates gear and waving their Jolly Roger flag, McCutchen raced back to the outfield wall and handed his batting gloves to the two kids who had been loudly cheering him throughout the game. The cameras caught a joyous 12-year-old Christopher McCreary and his 8-year-old brother, Elijah, overcome with joy. Christopher pointed at McCutchen and yelled, "I love you man, I love you." And just like that, GIF-able history was born. The exchange was shared thousands of times on a host of social media platforms. At the end of the season, McCutchen was honored for it by capturing the Esurance MLB Award for Best Player-Fan Interaction. December 2016: McCutchen committed to play for the USA in the 2017 World Baseball Classic. March 24, 2017: After winning the World Baseball Classic with Team USA, McCutchen reported to Pirates camp with a gold medal draped around his neck. "It was a heck of a lot of fun, so much that I lost my voice," McCutchen added. "It was a great experience, for sure. "It's a sport that speaks one language. It was amazing to see the different cultures, play against the different cultures and teams. The atmosphere is great. The fans, they came, they were loud. It was a lot of fun. I do think it's something that is very useful and needed. 'm just happy to be a part of it, being my first one and being able to win one was pretty cool." McCutchen said he enjoyed getting to watch Royals first baseman Eric Hosmer up close. And he enjoyed playing for manager Jim Leyland. "You get your sense of team camaraderie a little bit, just because you're with those guys for a couple weeks as opposed to the All-Star Game when it's a few days," McCutchen said. "It was really cool to develop some relationships with some of those guys and pretty much form a team and bond in two weeks. That's what the game of baseball does." It also provides moments they'll remember long after this spring. For McCutchen, that was Adam Jones' outstanding, homer-robbing catch at Petco Park against the Dominican Republic and Orioles teammate Manny Machado. McCutchen had a perfect view of the play from right field. After every home run, Andrew steps on home plate and reaches up with his right hand to tip his cap. It's a tribute to his wife, but also to the man who broke baseball's color barrier. The gesture is specifically to acknowledge his wife, Maria, but McCutchen picked it up from Jackie Robinson -- the version of Robinson depicted in the movie "42," at least. McCutchen watched Robinson tip his cap toward his wife, Rachel, after homering in the film and decided he would do the same. McCutchen rounded the bases and tipped his cap, as he always does on April 15, 2017. But for the first time, he did it while wearing Robinson's No. 42. McCutchen crushed a go-ahead, three-run homer in the seventh inning of the Pirates' 8-7 win over the Cubs on Jackie Robinson Day. Andrew lives a good life. He married his wife Maria in November 2014 after a romantic proposal on the "Ellen DeGeneres Show." The couple also recently announced they would be expecting a new addition to their family in December. On Instagram he announced he and Maria would be welcoming a baby boy to the family at the end of the year, and according to MLB.com's Adam Berry he is ecstatic. "We are proud to announce we are having a BOY! This has been the most exciting journey! Thank you to everyone who came to celebrate with us. This was a day we will cherish for the rest of our lives. Baby boy, we cant wait to lay our eyes on you!" Nov. 27, 2017: Andrew and his wife Maria announced the birth of their son, Steel Stefan. Jan 16, 2018: Andrew McCutchen began looking forward to his next act. But first, he reflected on the first chapter of his career. The former face of the Pirates' franchise was introduced to San Francisco media on a conference call with Giants executive vice president of baseball operations Brian Sabean, general manager Bobby Evans and manager Bruce Bochy. During the call, a reporter asked McCutchen to explain the emotional response to leaving Pittsburgh after nine seasons with one organization. McCutchen laughed. "How much time you got?" he said from his home in Pittsburgh's snowy suburbs. "To put it all in a nutshell, we have a lot to be excited about. We have a lot to be thankful for. We're very thankful for everything we have gone through, thankful for everything that has happened, thankful for the Pirates and the organization, for them having faith in me that I could be the player they felt I could be. We're thankful for that. We're also excited and looking forward to what's ahead of us. The emotions are high, of course, but we're excited about what's going to happen here in the future." Pirates general manager Neal Huntington called McCutchen twice: first to inform him of an incorrect news report saying the deal was done, then again to tell his franchise player that it was official and thank him for all he did for the Bucs. Considering McCutchen has been mentioned in trade rumors for more than a year, the news wasn't exactly a surprise. "Definitely the anticipation was high on my end, just because my name had been circulating a little bit. It was more of an anticipation, wondering if it was going to happen or it wasn't," McCutchen said. "When the reality of that hit, the emotions were definitely high. That comes with it. We're very excited, me and my family. We're excited and looking forward to the next chapter of our lives." McCutchen spoke highly of the Giants, saying San Francisco is "an organization who knows what winning is all about." He looks forward to getting to know Bochy and reuniting with former Pirates closer Mark Melancon, who joined the Giants last offseason. He even joked about moving back to right field, where he began last season for the Pirates before returning to center. "That's one place people can't pick on me, saying my defensive metrics are so bad," McCutchen said. Sabean said McCutchen was "kind of the apple of our eye in the offseason" as the Giants sought to pry him away from Pittsburgh, the only organization the 31-year-old had known since the Pirates drafted him 11th overall in 2005. Evans said he was "not convinced they would move [McCutchen] up until the last minute of our discussion." And yes, even Evans is still getting used to the idea of McCutchen wearing black and orange, not black and gold. Jan 26, 2018: One of the understated challenges for players trying to work on their games during the offseason is that most baseball activities -- especially fielding and hitting -- require a partner. Giants outfielder Andrew McCutchen found himself wanting to get some swings in. Just one problem: He didn't have anyone to pitch. So, he posted on Twitter: "Any High School coach in the Cranberry/Wexford,PA. Area want to throw a good ole pal(me) some BP today?" With a high of 52 degrees in Wexford, Penn, it was a beautiful day to join the former National League MVP for some batting practice. Clearly, many in the northern suburbs of Pittsburgh agreed, as Cutch quickly found a suitable partner. H later Twittered: "Found someone!!!!! Thanks for everyone who offered! He revealed the lucky winner later in the day. He Tweeted: "A big thanks to @CoachSeanTCT @NA_baseball2017 for helping a brotha out by throwing me some bp! Nice chatting it up w/ the Seniors as well." Buster Posey recalls watching Andrew McCutchen in awe. They were 17, spending a few weeks together as teammates on a junior Olympic team in Taiwan. McCutchen remembers Posey's immense popularity — swarmed at every single stop. Cheered when on the bus, or when fans just thought he was on the bus. “The one thing that I remember is all the Taiwanese natives really loved Buster Posey. I don't know why,” McCutchen said, chuckling. “But they'd be doing the whole roll call of the team, and they'd say Buster Posey and everybody would go crazy in Taiwan. We'd get on buses, we'd be on the bus waiting to leave, fans would be coming up, ‘Buster Posey, Buster Posey,' like, ‘He's not on the bus.' But I know he's a very likable guy, so I'd always joke with him about that in the times playing against him. Now, more than a decade later as early 30-somethings, they're teammates again with the San Francisco Giants. And McCutchen kind of understands it now. He thinks Posey is pretty cool. McCutchen considers the star catcher San Francisco's go-to guy. Andrew is a man of many talents. Baseball star. Thespian. Choreographer. Ambassador to the legends. It turns out that you can add impressionist to that long list of talents. The Giants had a guest behind home plate at batting practice on April 10, 2018 -- actor Mike Henry, who is most known for being the voice behind Cleveland Brown of "Family Guy" and "The Cleveland Show." Henry tweeted a video of McCutchen doing his own Cleveland impression to him, and he was blown away ... much to McCutchen's enjoyment. "I wish I could hit home runs as well as you can do Cleveland," Henry joked to the five-time All-Star. May 11, 2018: The trip back to Pittsburgh brought nothing out of the ordinary for Andrew McCutchen. He ate at The Oven Pizza Co. in Wexford. He slept at home, in Pittsburgh's northern suburbs, with his wife, Maria, and his son, Steel. He took Steel to a doctor's appointment for shots. "He was a big guy," McCutchen said. "He didn't cry." Then McCutchen took a familiar trip to an unfamiliar destination. McCutchen drove down to the north shore of the Allegheny River, walked into PNC Park and for the first time found his locker in the visiting team's clubhouse. "Good to be back. Still hasn't really set in yet, being on visitor's side. A little weird," McCutchen said before the series opener between the Giants and Pirates, an 11-2 Pittsburgh win. "I felt like I needed a few more steps. You always walk by it, but you don't ever notice it. Now you notice it." McCutchen couldn't help but notice what happened when he took the field. He ran out for warm-ups, and the crowd responded with a standing ovation. The public-address announcer introduced McCutchen, batting second and playing right field, and the cheers were even louder. The day had been full of reunions. McCutchen met with the Pittsburgh media for nearly 20 minutes in a news conference room typically reserved for the home team. He saw friends and former teammates during batting practice. Before leaving the field, he spent nearly 15 minutes signing autographs for fans. When McCutchen came to bat in the first inning, the Pirates played the first of two "Thank You 22" videos on their left-field scoreboard. Jameson Taillon stepped off the mound, Francisco Cervelli stood in front of the plate, and for 90 seconds, Pittsburgh expressed its appreciation for the former face of the franchise. What were his emotions like in that moment? "They were intense. Something to remember, for sure," McCutchen said. "I did my best to soak it all in. They did a good job giving me that moment. I signaled to [Cervelli] that I was ready to go, but he shook his head, 'No.' So I stepped back and continued to be in that moment." McCutchen tipped his helmet while shortstop Jordy Mercer and the entire Pirates outfield -- Sean Rodriguez, Starling Marte and Gregory Polanco -- clapped along with the fans. An "M-V-P" chant broke out. McCutchen went down looking at a called third strike, and the response was a mix of applause and boos. "Today might have been cooler than my debut, honestly," Taillon said. "That reception and just seeing him up there was really cool. I've never been a part of something like that, so I didn't really know when it was time to step on the mound. I'm glad Cervelli knew what to do." The Pirates played a longer video and another ovation ensued when McCutchen took his place in front of the Roberto Clemente Wall in right field. Fans stood and cheered before each of his five at-bats, and they celebrated his seventh-inning double off reliever Michael Feliz. It's no coincidence the Pirates drew a season-high attendance of 34,720 on McCutchen's first night back in town. "The man off the field is a very special and significant guy. The player on the field was a special and significant Pirate as well," Pirates manager Clint Hurdle said. "He'll be an iconic Pirate forever." For nine seasons, McCutchen called PNC Park's outfield his home. The city still is. He's a San Francisco Giant now, in town only to play the Pirates for the first time since being traded in January, but his attachment to Pittsburgh hasn't been broken. "This is my home. Me and my wife got married and made that decision a long time ago that this is where we're going to live, regardless of baseball," McCutchen said. "That's not going to change. We love it here." Dec 13, 2018: The Phillies announced they had signed free-agent outfielder Andrew McCutchen to a three-year deal that would bring him back to the state where he started his career. If you had any doubts that Cutch was excited to return to Pennsylvania as a Phillie, you can safely put them to rest. He posted an Instagram video that, unlike his prior work, was a cartoon. Nevertheless, it was just as delightful. McCutchen's appreciation for the Rocky theme song and his joyful dancing on the Art Museum steps should endear him to Phillies fans rather quickly. More importantly, though, if Cutch's contributions to cinema continue on their current trajectory, it won't be long until he finds himself inside the art museum rather than simply dancing on the steps outside. (E Chesterton - MLB.com - Dec 13, 2018). Dec 18, 2018: Andrew McCutchen had his introductory press conference in the City of Brotherly Love. While the veteran outfielder and Instagram star is sure to become a fan favorite in Philly, Cutch's young son Steel stole the show during the presser. Steel, whose name commemorates his dad's legendary run in Pittsburgh, follows in a long line of good sports children who have no reservations about taking over a press conference. Few will ever reach the stratospheric heights of Steph Curry's daughter Riley, but David Price's son Xavier was a key part of his dad's breakout 2018 postseason and Clayton Kershaw's kids once won a postseason postgame interview by sharing their thoughts on how Dodgers manager Dave Roberts took their dad out of the game before the ninth inning. McCutchen and the Phillies have a good shot at reaching the postseason in 2019, which would only mean more press conferences that Steel can derail with his adorable table-banging, microphone-grabbing delightfulness. Andrew held his 1-year-old son Steel on his lap, where Phillies general manager Matt Klentak and manager Gabe Kapler introduced him as the newest addition to a team with 90-win expectations. Father and son both wore Phillies jerseys with the number 22 on the back. Steel banged the table in front of him while his father spoke. The proud father beamed. "Something you always dream of," McCutchen said. "As a guy in the game you grow up and you always dream of sitting up here or even just be in the clubhouse and on the field and have your son with you. I was blessed enough to have a kid and on top of that I have a son and I'm just excited to just hold him and be up here. I'm overly excited and happy to be here and to be able to represent this city and this franchise." Steel's first baseball memories of his father will be of him in a Phillies uniform. (T Zolecki & J Mintz - MLB.com - Dec 18, 2018). Dec 31, 2018: Andrew McCutchen has made plenty of headlines over the years, but this offseason, his son Steel has stolen the spotlight from his All-Star dad. It didn't take long for Phillies fans to learn that McCutchen wouldn't just be bringing his own stage presence to Philadelphia -- Steel knows how to perform as well. But it seems that little Steel is ready for more than just the press conferences -- he's ready to take his talents out onto the field. "Doing one handed drills. I told him to use two hands but he insisted his bat was only made for one hand", says Andrew. Not quite the picturesque swing that his dad has perfected over his Major League career, but he's still early in the player development process. Launch angle enthusiasts may encourage the younger McCutchen to swing up, rather than hit the ball into the ground. Regardless of his swing mechanics, Steel certainly caught one Hall of Famer's attention - Ken Griffey Jr! "The boy looks like a lefty to me, " said Griffey Jr.
June 13, 2005: Andrew signed with the Pirates organization for a bonus of $1.9 million after they drafted him in the first round, out of Fort Meade High School in Fort Meade, Florida. Rob Sidwell was the scout who signed him. March 5, 2012: Andrew and the Pirates agreed to a six-year, $51.5 million contract. Nov 3, 2017: The Bucs announced they will exercise McCutchen's $14.5 million club option for 2018, his final year under team control. The alternative was to buy out McCutchen's option year for $1 million and make him a free agent. Jan. 15, 2018: The Pirates traded McCutchen to the Giants for Kyle Crick, Bryan Reynolds. And the Giants sent Pittsburgh $500,000 in international bonus pool space, while according to MLB Network insider Ken Rosenthal, the Bucs will pay $2.5 million of the $14.5 million McCutchen is owed in 2018, the last year of his contract. August 31, 2018: The Yankees sent INF Abiatal Avelino and righthander Juan De Paula to San Francisco for OF Andrew McCutchen and cash considerations. Oct 29, 2018: Andrew chose free agency. Dec 11, 2018: The Phillies and "Cutch" reached an agreement on a three-year contract. The deal is worth $50 million and includes a $15 million club option, and a buyout for 2022. Though not a very big guy at 5-foot-11 and 175 pounds, McCutchen is the complete ballplayer. He has the lightning-quick hands and strong wrists that generate bat speed to provide lots of offense. He centers the ball on the barrel of the bat very well and hits the top half of the ball quite often. He nails even the real good fastballs and even hits breaking pitches well. Andrew has very, very quick hands and a short, compact swing. He lines shots all around, and over the fence in any part of the park with that superb bat speed. Scouts have compared McCutchen to longtime Major League outfielder Marquis Grissom, because of the strong, wiry body. Andrew has very good strike zone knowledge, is now patient, recognizes pitches very well and has a high on-base percentage. He is able to wait for the ball to geet deep into the hitting zone. McCutchen doesn't get rattled by anything, even a long slump. He has a calm about him that is hard to describe. He maintains that inner confidence that he will perform well next time out. He has excellent instincts and is intelligent. His pitch recognition is very impressive. McCutchen improved at his ability at bunting, adding that to his arsenal so that he can maximize his speed by taking advantage of opportunities when the opposing third baseman is playing back. You could argue that the six weeks McCutchen spent at IMG Academy in Bradenton, Florida before the 2012 season—a first for him—made the difference. It was two-a-day conditioning sessions and yoga and pool sprints and pushups with 50 pounds of chains wrapped around his torso. But McCutchen's transformation wasn't about his body. It was about spending the offseason learning not to try to hit a homer every time up. About clearing one's mind and taking what the pitcher gives you. Pirates manager Clint Hurdle noticed it immediately when Andrew reported to spring training sporting a new, awkward-looking stance that Andrew had worked on along in the offseason. The hands that used to be shoulder level are now below the letters. The bat is tight against his chest. The front leg is opened up toward the shortstop. The stance, McCutchen told Hurdle, helps him see the ball better, and his stride—coming back toward the middle as he swings instead of out toward the left—guards against any "pullitis." Pirates teammate Neil Walker noted: "Most guys, they are either looking for something hard or something soft. Cutch's hands are so quick, he doesn't have to. He can adjust to anything.". On April 30, 2015, Andrew reached 1,000 hits. Hit No. 999 was a step in the right direction, as McCutchen ripped a two-run triple off the ivy in center at Wrigley Field in the sixth inning. Two innings later he pulled an 88-mph slider from Cubs reliever Edwin Jackson down the third-base line and beat Kris Bryant's throw to first base to reach the 1,000-hit milestone. "It's a special time, absolutely," manager Clint Hurdle said. "When your best player is one of your hardest workers, it makes everybody's job easier. "McCutchen is the 33rd player in Pirates history to collect at least 1,000 hits, all of them with Pittsburgh. Jack Wilson was the last player to record each of his first 1,000 hits in a Pirates uniform, having done so in 2007. "It's special. I feel like that milestone is a pretty big one," starting pitcher Gerrit Cole said. "It's a pretty big hit for him. You know how he started. For him to just be able to keep grinding and keep such an even keel and not let it affect anyone else on the team and stick to his approach, it's a testament to how good of a pro he is." April 26, 2016: Andrew blasted three home runs and collected five RBIs to pace the Pirates to a 9-4 victory over the Rockies at Coors Field. McCutchen, who also hit three homers Aug. 1, 2009, against the Nationals, had a chance to become the first Pirate to hit four in a game, but he grounded out to short in the eighth. He became the fourth Pirate to do it more than once, joining Hall of Famers Ralph Kiner (four times), Willie Stargell (four) and Roberto Clemente (two). McCutchen reached a turning point late in My, 2017, when manager Clint Hurdle sat McCutchen for two days and dropped him to sixth in the batting order from his customary third spot. Then Hurdle sat back and watched an artist at work. September 13, 2017: The 200th homer of McCutchen's career made him the fourth player to reach that milestone in a Pirates uniform. May 14, 2018 : McCutchen recorded his 1,500th career hit. As of the start of the 2019 season, Andrew's career Major League stats were: .287 batting average, 223 home runs and 1,608 hits with 790 RBI in 5,602 at-bats. McCutchen is a superb outfielder. He reminds scouts of Marquis Grissom. But Andrew says he was inspired to play good defense by his boyhood baseball hero. "I grew up watching Ken Griffey Jr.," McCutchen said. "I admired his style of play. He was one guy whose play I really enjoyed." He covers a whole lot of ground in center field with his speed, especially that first-step acceleration. He gets a good jump on the ball, reading it off the bat well and then gliding to it to make the catch. He gets to balls few others can reach. Andrew has only an average arm, at best. But that is his only average tool. And in 2011, he was keeping the ball down, not throwing the ball over the cut-off man. He hits the cutoff man and throws to the right base. In 2012, Andrew won his first Gold Glove. Andrew makes the game fun, loose, and relaxed. "I saw a stat that the average game is three hours, and for me, as an outfielder, the actual time you're moving is nine minutes," Cutch related late in the 2014 season. "Nine minutes of actual movement. It's a tricky game—your head has to be into it. That's why yo gotta make it fun." While he's standing out in the outfield, he says, he tries to predict the pitches, and when he's bored with that, he sings to himself. And then he starts singing in a falsetto that would make Justin Timberlake proud, "It's tearin' up my heart when I'm with you...."
Andrew has excellent speed. He has been timed at 6.3 seconds in the 60-yard-dash. And he is clocked at 4.1 seconds getting down to first base, sometimes. Other times, he doesn't get down to first base that quickly because he has such a big swing. McCutchen is very fast under way. He has the speed to steal lots of bases. In 2007, he stole 17 bases in 18 tries in the Eastern League. In 2008, he was caught 19 times while stealing 34 bases successfully. In 2009, in the International League, he stole 10 bases in 12 tries. In 2009, in the Majors, he stole 22 of 27 bases successfully. From 2010-2013, Andrew stole his share of bases, but had his share of caught stealings too. But in 2014-2015 combined, he got his groove back, stealing 29 bases in 37 attempts. In 2016, he was successful in only 6 out of 13 attempts. He is learning more about how to get jumps and read pitchers. Andrew has 70 speed on the 20-80 scouting scale. However, McCutchen is slow getting out of the batter's box, which prevents him from getting as many infield hits as his speed suggests he should. McCutchen is aggressive at taking the extra base. In 2010, McCutchen's speed impressed teammate Ryan Church during spring training. Church had signed with the Pirates as a free agent during the offseason. "He's so damn quick, it's amazing," Church told ESPN.com's Jerry Crasnick. "It looks like he's just floating through the air." McCutchen also went into that season deciding to be more aggressive on the bases, particular with stolen base attempts. "Every time I have an opportunity, I just go," McCutchen said. Andrew's ability to steal bases upsets the opposition. "I have the green light so I'm able to run when the time is right," McCutchen said. "I pick my spots, and then I go. You don't always have to be the fastest, but you need to be smart, knowing the counts, knowing the pitcher, and knowing who is hitting. So if you know all those things, it can help you out when it comes to stealing bases." During 2011 spring training, McCutchen worked with Pirates coach Luis Silverio on his base-stealing. They wanted to eliminate any extra movements that add time. And he improved his balance. Fall 2003: Andrew's parents were in the stands watching Fort Meade High play the night their son, a sophomore, took a kick return, ran up the field, and instead of ducking out-of-bounds, tried to run over a defender. His ACL and MCL were torn with the hit. His father, Lo, sobbed like a baby that night, feeling that somehow he'd let his son down, allowing him to play football even though baseball was his real love and ticket to college. After the injury, it was all baseball. August 4-19, 2014: Andrew was placed on the D.L. with an avulsion fracture involving the costochondral cartilage of the left 11th rib. He injured it while hitting. But he was hit in the ribs by a pitch the night before. It was his first trip to the D.L.